Bavarian clock - How much watch ? In Bavaria the clock runs otherwise ! The clock run backward - left clockwise. 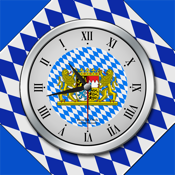 Show the bavarian clock your friends when they ask for time of day. Wait, how quickly they can realize the time. It's funny and crazy ! ● 3 Clock Themes, change with shaking gesture.